I got the opportunity to try these wonderful laundry pods thanks to the good folks at Purex. I have never used a laundry pod before so I was eager to see how well they worked. The pods are filled with Purex's concentrated DirtLift Action liquid formula as well as Zout stain removers. The result is 2x the cleaning power so that your clothes are bright, white and clean. The first thing I noticed was how easy it was to use these ultrapacks. You just throw one in each load of laundry and off you go. No lugging heavy bottles of detergent, no mess and no fuss. They dissolve quickly in the washer. As for the end result, I washed both whites and darks with this product. The whites were noticeably brighter and a few of the items of clothing had stains which were completely gone. Usually I use a stain pre-treater and that doesn't always help remove the mess. The clothes had a great scent as well. Purex UltraPacks plus Oxi are safe for HE washers. I was very happy with this product and would definitely recommend it. I am giving away to three lucky winners a free coupon for Purex UltraPacks plus Oxi detergent. So enter for chance to try this great product. 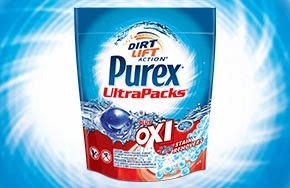 I would love to try these Purex Ultrapacks plus Oxi detergent. 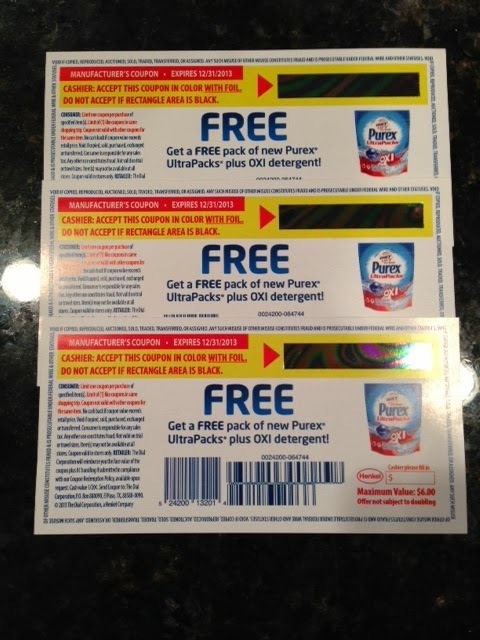 I have used other Purex products and they have worked well. These are amazing! I loved the review, thanks!